It’s not often a university would highlight one of its alumni who spent time as a panhandler. But in the case of David Spears (G13), his experience on the streets of Oregon City represented a quest for knowledge, not money. Spears, who double-majored in economics and political science, is an economic assistant with the United States Bureau of Labor Statistics, Portland office. His panhandling career was brief – just 12 days – but it helped him establish a new sideline interest, publishing, in addition to his full-time job. Last August, with the release of his self-published book Exit Ramp: A Short Case Study of the Profitability of Panhandling, Spears received Northwest television and newspaper coverage for his findings. His experience showed that, as a panhandler, he could make $11.10 an hour – more than Oregon’s minimum wage, then at $8.95 an hour. He hardly looked like a George Fox student while conducting his research. 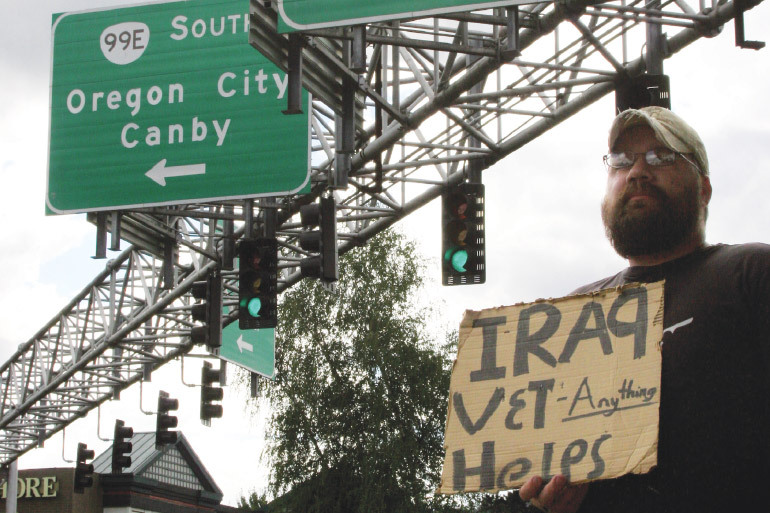 Photos show Spears, 33, with a bushy beard, tattered clothes and a cardboard sign with the words, “Iraq Vet – Anything Helps.” He conducted his research at an Oregon City exit ramp the summer before his senior year. He then spent the rest of the year working on his book, completing it just after graduation. ... as a panhandler, he could make $11.10 an hour – more than Oregon’s minimum wage, then at $8.95 an hour. His panhandling project produced a variety of findings: donations ranged from four cents to a $100 bill. He averaged $5.13 per hour his worst day (the first) and $24.63 per hour on his best. One of every 59 people driving by gave money. Middle-age people (between 25-49) gave much more than older or younger people. Although accounting for only 39 percent of insured drivers in Oregon, middle-age drivers made up 80 percent of donors. There was not much difference in giving between men and women. Some offered jobs or rides; others gave him sports drinks, gift cards, bottled water, beef jerky or homeless care packages. Spears admits to suffering an internal dilemma about accepting money he didn’t need. He already had a part-time job as a church janitor. And as a twice-decorated Iraq war Army veteran, the GI Bill® was helping with college expenses. “The great thing about this study was actually being able to create a usable set of data,” Spears says. He points out the study came as a result of his George Fox classes. He says professors taught him that college is more than textbooks and that he not only should be involved with gaining knowledge but also with contributing to knowledge. “The environment created the inspiration,” he says. An Oregon City resident with four boys, Spears and his wife are cofounders of Madison Street Publishing, a micro-press specializing in helping unknown authors, with seven works now published. He has aspirations of expanding his writing and publishing as a “long-form journalist,” with two other short books in progress.